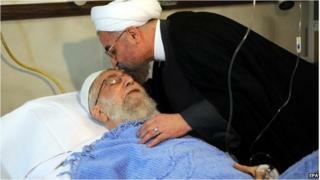 Iran's Supreme Leader, Ayatollah Ali Khamenei, is recovering from prostate surgery, state media say. The operation, which took place on Monday at a government hospital in the capital, Tehran, was said to be "routine". An announcement about the surgery ahead of the procedure was unprecedented, as the Ayatollah's health is traditionally a confidential subject. The 75-year-old cleric has led Iran since 1989 and is its top authority. Earlier on Monday, Ayatollah Khamenei was seen on Iranian state television asking people to pray for him, but said there was "no room for concern". Ayatollah Khamenei's health has always been a secret topic in Iran, like other aspects of his personal life, says BBC Persian's Bozorgmehr Sharafedin. In January 2007 a rumour of the Ayatollah's death spread in Iran and the world, simply because he did not announce he had a bad case of flu and could not attend public ceremonies, our reporter says. The Ayatollah's appearance on TV before the surgery and announcement of the news by himself is a clear change of approach. Either he knows that the critical situation in Iran and the region cannot bear another rumour of his death, or he has decided to be more open about his personal life, our reporter adds. In 1989, Ayatollah Khamenei succeeded the first Supreme Leader and founder of the Islamic Republic of Iran, Ayatollah Khomeini, following Khomeini's death. As the country's highest authority, Ayatollah Khamenei's power outranks all politicians, including the country's President Hassan Rouhani.